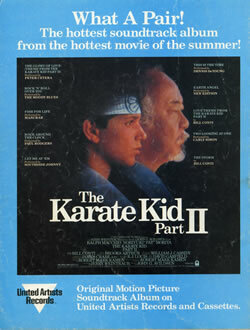 While the most movie souvenier magazines of the time featured a good amount of behind the scenes footage and extras that you might find as bonus features on a DVD today (such as the Goonies magazine recently featured on Branded in the 80's), the Karate Kid Part II magazine leaves a little to be desired. I got this magazine in 1986 and must have looked at it many times over since the cover is showing some pretty good wear. As I looked through the magazine, I realized that it's basically just a recount of the movie -- more of a Cliff's Notes version of KK2 rather than a collector's magazine. 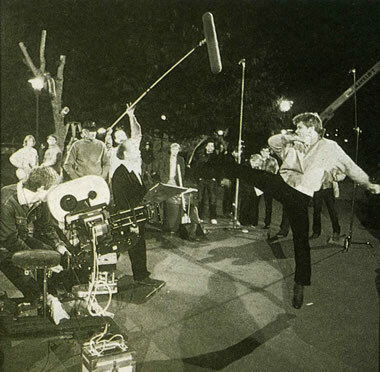 Among the many pictures from the movie itself, there were still a small handful of behind-the-scenes shots. 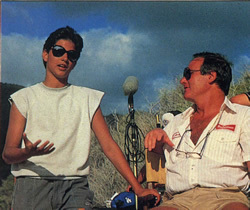 Above, you see Ralph Macchio talking to Producer Jerry Weintraub -- who's looking sharp in his Budweiser delivery guy shirt. 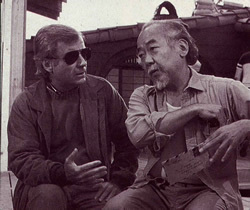 Also, Pat Morita talks with Director John Avildsen. In addition, there's a cool shot from the scene where Kreese and Miyagi face off in the parking lot. 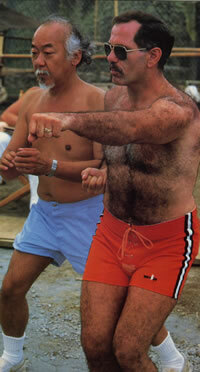 The opposite page shows Pat Morita training with Pat Johnson -- "the man responsible for staging the incredible karate scenes." 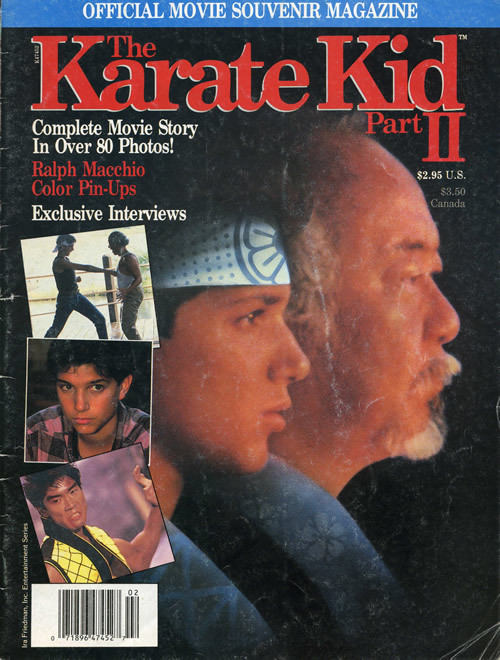 One thing I found interesting about this magazine was the fact that it is laced with advertisements; not ads for Pepsi or McDonalds -- but ads for Karate Kid merchandise. 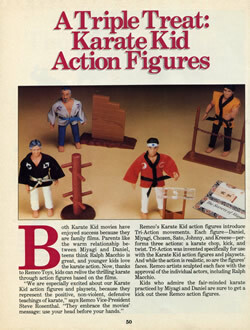 The inside cover has an ad for the second series of Karate Kid action figures and only two pages later, readers are offered the first two installments from the B.B. 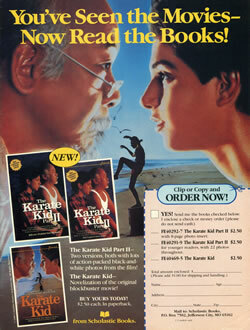 Hiller set of Karate Kid books. 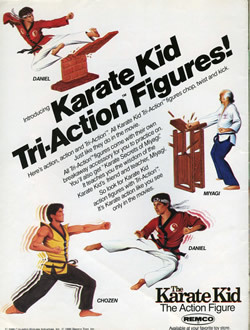 The back cover plugs the KK2 soundtrack and the last page of the magazine itself is yet another look at the action figures.